It appears that Gerard Ryan has taken the time to write a little letter to tell Dialogue Ireland exactly what he thinks about our protests. This blog entry is what I think of it. The first thing that strikes me about Mr. Ryan’s letter is that according to him, apparently, we Anonymous protesters are Mike Garde’s “acolytes”. Dear (name snipped), I write to keep you up to date with the latest “activities” of your field worker, lest you risk being kept out of the loop (and thus deficient in knowledge) of what is being done in Dialogue Ireland’s name. As you know your Field Worker has been demonstrating outside our Church on a monthly basis, with his acolytes, as part of a hate campaign against my religion. On the most recent occasion (13.9.08), your Field Worker made a hate poster in situe, and sported it for the passers-bye “edification”. The hate demonstrations have remained largely masked teenagers (albeit cyber-anarchists and some outright criminals) but you Field Worker has encouraged a couple of adults to get involved. However on 13th Sept, this attempt to drum up some numbers reached a nadir, which even I thought could not be achieved, when infants and very young children (four of them, apparently between the ages of two and six years) were used to hand out hate propaganda leaflets at the demonstration. According to our teachings, one cannot become a member our Church under the age of 18 years (unless one’s parents are Scientologists). Meanwhile Dialogue Ireland uses infants to further its tendendatious agenda. There is a certain irony in that. We already know that your Field Worker apparently sees no problem in using personal property stolen from me, and infringing my privacy and intellectual copyrights, but I genuinely hoped that Dialogue Ireland had some moral compass, somewhere. Surely Dialogue Ireland’s claimed Christian convictions means something other than a flag of convenience? I have always looked to current behaviour, to determine whether a person or group has any decency or not. The history of many individuals and groups is not always pleasant. But what are they doing now? The history of the Catholic Church is quite savage in many respects, but what is it doing now? Even the history of Nelson Mandela is not perfect. But what is his current behaviour? I believe the current behaviour of you Field Worker speaks for itself, and and as for the ethics of those enabling such behaviour………?. The sign Mr. Ryan objected to which referenced Hubbard Scientology policy to ‘Make money’ and to ‘Make more money’ and to ‘Make other people produce so as to make more money’. Given that this was the clearest shot of the sign I have in my footage, and given that Mr. Ryan was in the building across the street for the duration of the protest, I can only conclude that Mr Ryan possesses the eyes of an owl. Genuine question here – how do I respond to a letter like that? I could do a line by line rebuttal. I could post protest footage to refute his claims. I could even contact the RTE rep who was there for comment. But I won’t. I won’t do any of those things because to do so would be to afford Mr. Ryan’s crap far more respect than it deserves. You, and I sincerely hope you are reading this Gerard, have systematically lied and scaremongered about Anonymous to any and all journalists who would give you the time of day. After 8 global protests, spanning cities from Adelaide to Winnipeg and Dublin to Tel Aviv, and still not ONE SINGLE ACT of public disorder you and your Scientologist commentators are starting to look like the ‘boy who cried wolf’. BBC report of 15-year-old Anonymous master criminal ‘Epic Nose Guy’ being issued with a court summons for committing the grievous crime of using the words ‘dangerous cult’. The charges were dropped by the CPS due to ridiculousness. “Anonymous" has publicly proclaimed its guiding materials to be the Communist Manifesto and Mein Kampf. Quite obviously, this group is not just anti-Scientology, it is anti-freedom of religion and anti-free speech. Anonymous is perpetrating religious hate crimes against churches of scientology and individual scientologists for no reason other than religious bigotry. Scientologists protesting outside the Clearwater Sun newspaper building. 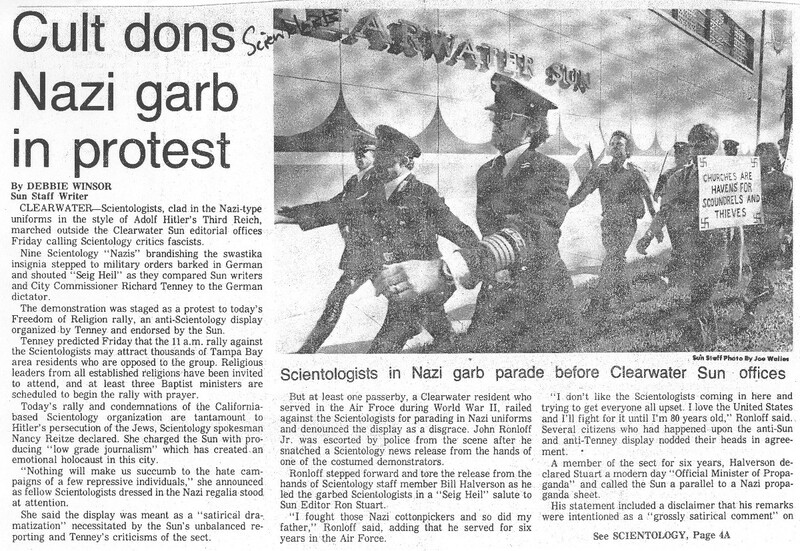 Scientologists welcoming Ursula Caberta, a German government official, to the US. Yes, they really did scream ‘Nazi’ at her. Makes Mr. Ryan’s claims of Anonymous being a ‘hate group’ seem even more hypocritical. Paulette Cooper, who authored the book ‘The Scandal of Sceintology’, was severely harassed by the cult. Rather than simply accuse her of terrorism or criminality the cult fabricated bomb threats against themselves in order to have her arrested. Even the BBC has met the cult’s wrath. Following the 2007 Panorama documentary Scientology released their own counter-documentary which accused the BBC of orchestrating a protest that led to a ‘terrorist death threat’. P.J. Phelan on the Late Late show in 1995. His letters attempting to rescue his brother Tony from Scientology were branded as ‘terrorism’ by Scientologist spokesperson Peter Mansell. Tony’s sister Ann, who hasn’t seen her brother for over six years, has been attending the Anonymous protests. Simply – keep it up. The more you and your Scientologist colleagues slander and lie about your critics the more ridiculous you all look. Or do think that by slandering us to Dialogue Ireland you will somehow manage to disrupt our protests??? Wise up. Also – the children had such a ball at the last protest that they want to come to the next one. Do you want to break their little hearts and tell them they can’t come? new idea for poster" Im only 6 and even i know scientology is a dangerous cult"
I lolled and so did the kids .